I must say that ranch dressing is somewhat addictive and goes with all the bad choices one can make-cold pizza, chicken wings, French fries, burgers and anything you may want to smother, such as something bland or lifeless on your plate. Just think of all the times Guy Fieri has said he could put something on a flip-flop and eat it. It can cover a lot of mistakes. Commercial ranch dressing is one of those things. I am not advocating that you go out and stock your shelves with every shelf-stable brand on the market and have it with your dry-aged strip. Growing up on the east coast in the ’70s, ranch dressing wasn’t a common thing; it was seen more as part of a marketing plan to get your kids to eat more vegetables versus the next great flavor. With that said, go down any grocery store aisle today and you will see a minimum of 10 different producers and flavor variations, from buttermilk to sriracha. Living in the midwest, it is everywhere. While I was sipping a nice local märzen (it is fall, of course), I started to remember how many variations of ranch I wrote for menus: chipotle, wasabi, horseradish and on and on and on! I started to think a little deeper on why and what makes ranch such an iconic condiment. Remember, it is no longer a salad dressing; it is a condiment just as popular as ketchup and salsa. It didn’t take long to figure out why. It is loaded with two major flavor bombs: lactic acid from buttermilk and glutamates from MSG. Yes, folks, monosodium glutamate is one of the major players in commercial ranch dressing. Both those compounds are packing the umami factor. The level of umami in ranch dressing is what makes it so yummy. Don’t deny it! 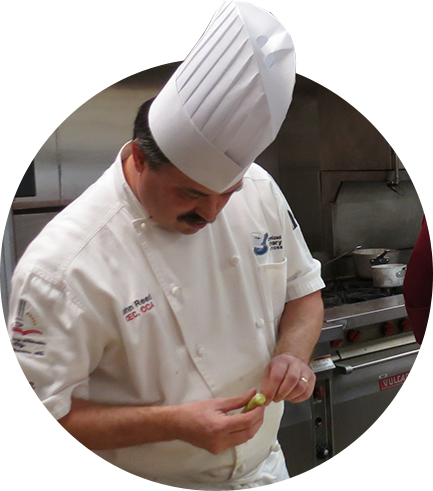 As chefs, we try to make our food stand out and want guests to come back for more. It kills me every time I dip those damn wings in ranch. It is so satisfying but so wrong at the same time. I wanted to figure out how to capture the savory flavor of that umami bomb in my food. So, I started looking at ingredients that are naturally packed with MSG versus pulling out the gram scale and opening the Ajinomoto! MSG is a natural product that has been highly studied over the years, and we are still debating the pros and cons. However, the isolated glutamate is common in many natural products. The two most common that contain high levels of the stuff are tomatoes and parmesan cheese. Think of those two ingredients together. Other items are dry-aged meats and fermented items such as kimchi and pickles. Dried mushrooms and seaweed such as porcini and kombu scream umami, dive into a bowl of ramen or miso soup and try not slurp it down. I now look at adding a little touch of glutamate-rich ingredients into the food I cook, from mashed anchovies in a braised dish and parmesan powder in vinaigrettes to vinegar powder in dry rubs or mushroom stems in stock. I call it the “Hidden Valley factor”! The understanding of the balance of flavors has been around a long time all over the globe, but it took a somewhat ubiquitous supermarket staple to bring the flavor to tables across the country. Sorry Chinese restaurants, but you got a bad rap, as they were honest in that they used it! Yes, I was drinking an Old Style. This is their first new beer in 15 years, and it’s worth a taste. It is a limited run, so try it now. 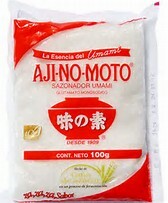 You can find Ajinomoto in most Asian markets and is something you just investigate to understand the effects of umami on the foods you cook. Sold as umami seasoning.